Besides valuable meetings with entrepreneurs and business professionals, the students were given two workshops. Mathijs Koper, owner of Outside Inc., shared his knowledge about revenue models for social enterprises. In addition, students were given an insight into how customers will look at their products and social enterprises. Eefje Seijsener also gave them a workshop on Customer Journeys. Very valuable, according to the students. Maud, from the team National Social L, said "At Inspiration Day we started thinking about matters that we never considered before. There are many practical things we need to regulate and things we must take into account." Luuk from the team, WallstreetWankers, said, “I find it very interesting to get in touch with business people so quickly." Students have until April 14 to improve their plans, at which point the ten best teams will be selected. They may pitch their business plan in the exciting national SIR final. 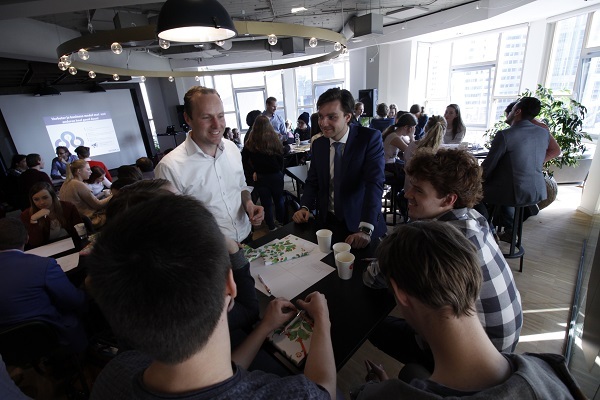 On June 21 one of the Dutch teams will be selected to represent the Netherlands in the global SIR final, with students from countries including Japan, Spain, Bulgaria and Singapore. Inspiration Day is part of the project Social Innovation Relay. This is a competition in which young people think of a novel idea to solve a social problem. The project was set up in the Netherlands by Jong Ondernemen in cooperation with NN Group. In total, more than 1,100 students in the Netherlands participated in this project.